Why is there still geek shame? Allow me to indulge in some personal catharsis for a little while. Don’t worry, there is a point to it. Last week, I saw this Ikea advertisement on Reddit. 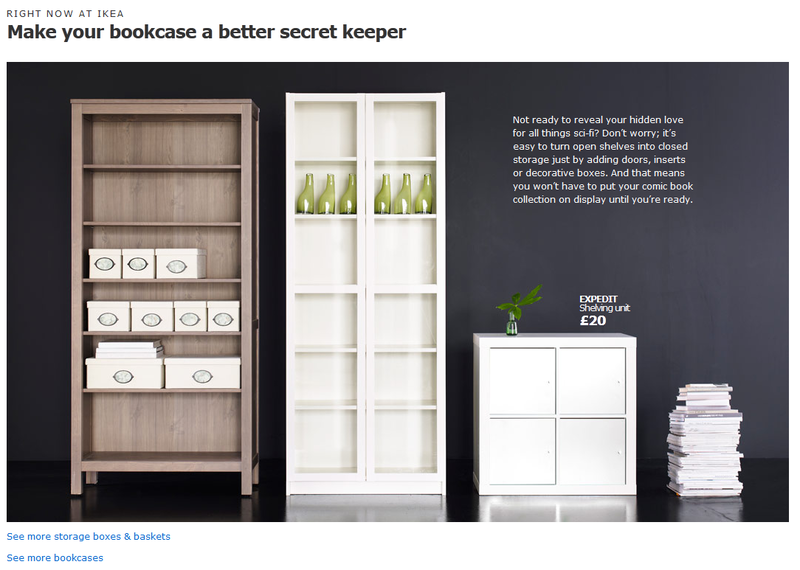 In case for some reason you can’t see the picture, it’s an ad for bookcases with the added bonus of doors and boxes, which would go great with your sci-fi collection that you’re so embarrassed about and want to hide. Apparently this is because being into “nerdy” topics is something that you would want to hide from your family members, something that you’re ashamed of. It’s akin to being too scared to come out of the closet so you hide pictures of your boyfriend or girlfriend. But when did being a nerd become something to be terrified of? When did it become a reason to hide in the “nerd closet?” Has anybody ever been disowned because they liked sci-fi novels? Is it illegal in some states to enjoy your Star Wars poster? I’m sure these kinds of things have happened, but the events are few and far between. The idea that sci-fi is something to be ashamed about is nothing but a dangerous stereotype; only dangerous because of how outdated it is. I understand that there are indeed some people who see their geeky interests as a badge of shame. I know because I was one of them at one point. There was a certain unspoken rule about things such as anime and comics. Kids who were into those kinds of things always got made fun of. Back in middle school, that was the worst punishment: to be outcast by your peers. I hid my love of X-men and manga because people thought it was weird but overtime, most of us got over that and found people that enjoyed it as well. So no, in retrospect I didn’t have a problem with it. My parents didn’t find much wrong with it either. I loved my nerd collection and no, I didn’t keep it all in the closet. I put it on display with posters, books, and my growing collection of Magic: The Gathering cards. My Marvel comic book backpack is too big to be ignored (seriously, it’s bigger than my torso) and my Doctor Who T-Shirt and snow hat are two of my favorite pieces of clothing. I wear it as a badge of pride. Now that being a nerd is “cool,” my limitless knowledge on the Marvel universe is actually a coveted trait. My sister, who is still in high school, is not a nerd in the traditional sense, but she has a scary encyclopedic knowledge of Korean culture and pop music and shares it with her friends. Her friends in turn are film buffs, anime otaku, and flaunt it on their Facebooks and in their fashion choices. These kids have tons of friends, and in person, they aren’t the nerds from 80s movies. Sure there is still a certain stigma with being in a specific “clique” but the social suicide surrounding being into nerdy and geeky subjects is mostly gone. The popularity of Doctor Who, Marvel movies, video games, and the resurgence of science fiction in these mediums is proof of that. So moral of the story, don’t buy from Ikea. You’re welcome world. Also, I think this is something I need to prove and explore. Is geek shame really still a thing?